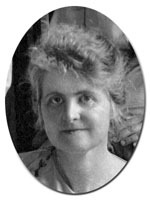 Winifred Moses, a Canadian-born nurse and teacher, came to Cornell as a student in 1912. By the time she arrived at the School of Home Economics, Moses already had an impressive academic history. She attended university in Nova Scotia, and also went to a normal school where she received her diploma in teaching. Winifred subsequently trained as a nurse at Miss Juletta Wilson's Private Hospital, also in Nova Scotia. Moses spent the summer before she came to Cornell at the Experimental Garden School in Canada, where she studied horticulture and plant life. After graduating from Cornell in 1915, Moses became an instructor in the Food Department while also working in extension, giving talks about first aid. In 1921, Moses was recruited by the American Red Cross for her skills in nursing as well as in nutritional sciences. During her time with the Red Cross, Moses wrote reading courses on nutrition for nurses. Winifred returned to Cornell as an instructor in 1924, and also worked as the household editor of Charm magazine, a publication that was later absorbed by Glamour. Moses was best known for her writing about the etiquette of table setting, creating nine different table settings for various occasions. While her pursuits shifted during her life, her goal remained the same: to legitimize and elevate women's positions both inside and outside of the home.